The Governor’s bag ban is a step in the right direction. Gov. 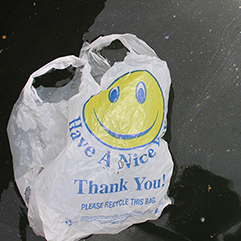 Andrew M. Cuomo recently announced his intention to ban plastic bags across New York State as part of his executive budget. This is a significant move, for which we are grateful, that will help address the plastic pollution crisis and will have reverberations far beyond New York’s shores. That is why it is critical to get the policy right in New York. The proposal from the Governor doesn’t go far enough and must be amended to address the water and greenhouse gas emissions impacts from paper bags to ensure that New York State doesn’t replace one single-use product, and all its problems, with another. While the press release contains few details, we know so far is that if it passes single-use plastic bags’ days are numbered in New York. The Governor’s bag ban is a good thing; a great thing to celebrate! Microplastics and large pieces of plastic are a threat to wildlife, particularly to marine life. We even find microplastics in the Hudson River! That the Governor has embraced the fight against plastic pollution with his proposal to ban the single-use plastic bag and expand New York’s Bottle Bill is an enormous step in the right direction. However, regarding plastic bags, the proposal only gets the job half done. To complete the task, the Governor’s bag ban must include a fee on paper bags! At a minimum, the Governor and legislature should include enabling legislation to allow local governments that impose fees on paper bags to use some of the funds for environmental purposes. The fee on paper is a crucial incentive for customers to remember to bring their own bags — and prevent a wholesale switch from plastic to paper. Consider one key environmental impacts of paper bags highlighted in DEC’s own report: they are much more water-intensive to produce. Also, DEC’s survey of 13 communities with plastic bag laws on the books in New York found that those policies that did not include a fee on paper bags saw an increase in their use. Paper bags are also heavier to transport and the switch may lead to an increase in greenhouse gas emissions, something we can’t afford with the current climate crisis. Consider the experiences of Chicago and Honolulu. Both cities passed bans on plastic bags and later repealed their bans and replaced them with fees on paper and plastic. Chicago had a ban in effect for 16 months before replacing their ban with a 7-cent fee on paper and plastic. Their initial ban on plastic bags of a certain thickness led stores to use thicker bags and did not lead to any discernible decrease in single-use bag use since customers used the new thicker bags provided to them. Honolulu faced the same issues. To avoid this problem, the state of California, after numerous local governments from Los Angeles and San Francisco experimented with policies, adopted a ban on plastic bags with a 10 cent fee on paper bags. The fee goes to fund environmental cleanup efforts. In San Jose, after they adopted a ban with a fee on paper their reusable bag use increased from a meager 4 percent to a whopping 62 percent! The ban/fee approach is the gold standard and is the approach taken in the New York State BYOBag Act (S95) sponsored by Senate Environmental Conservation Committee Chair Todd Kaminsky. Nearly 100 environmental groups also support this approach. The NYS BYOBag Act would exempt customers on SNAP and WIC assistance and would dedicate some of the collected fee to the state Environmental Protection Fund. Riverkeeper looks forward to working with the Governor and our partners in the legislature to ensure that we have the right policy on the books to eliminate single-use plastic bags and encourage customers to bring and use their reusable bags.